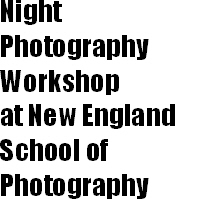 Please join me for the fall 2013 Night Photography Workshop at New England School of Photography. Classes start on September 18! Info below. New technologies in photography have made Night Photography more accessible and popular than ever. Digital cameras allow for instant feedback that can serve as a guide for determining exposures, but there is more to successful night photography than simply exposure. This class will cover lighting, contrast, atmosphere, equipment choices and subject matter— all important factors in shooting at night. Over the course of the workshop, we will explore the world of night photography with both film and digital cameras, working with the light of the moon as well as with artificial light sources. During the course, participants will create a body of nocturnal images in a variety of locations. From relatively short exposures by streetlight to full moon exposures of an hour or more, we will explore the range of possibilities within this genre. Prerequisite: Fundamental digital or analog camera functionality. Students must have an SLR camera with a bulb setting, a tripod and a cable release.